Viewed from the 274-foot level mobile launcher, a crane positions the Orion crew access arm (CAA) so it can be attached to the tower that will support the Space Launch System (SLS) rocket at NASA's Kennedy Space Center in Florida. The walkway that astronauts will use to board NASA's next spacecraft bound for the moon has now been raised into place. Workers on Monday (Feb. 26) used a large crane to hoist up and attach the Orion crew access arm on the Space Launch System mobile launcher tower at NASA's Kennedy Space Center in Florida. The new arm is similar in design to the previous walkways used with the Apollo Saturn V rockets and space shuttle orbiters. 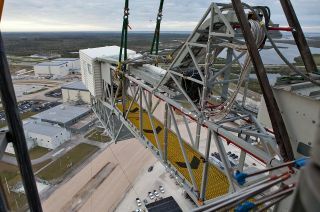 The crew access arm (CAA) was installed at the 274-foot (83.5-meter) level of the tower, which stands in a work yard outside Kennedy's Vehicle Assembly Building (VAB), wherein the SLS will be prepared. The tower was originally built for NASA's Ares I rocket, which was canceled in 2010. It has since been modified to support the configuration of the larger and more powerful SLS. The 60-foot-long (18-m) CAA is comprised of two major parts — a truss assembly and an environmental enclosure, the latter known as the "white room," which caps off the rocket-facing side of the arm. "It is given that name not only because it's painted white, but also because it's kept clean to avoid contaminants entering the spacecraft prior to flight," wrote Granath. "The crew access arm is designed to rotate from its retracted position and line up with Orion's crew hatch." Astronauts will cross the CAA and pass through the white room to enter the Orion capsule, or use it in reverse in case of an emergency on the launch pad. The arm has a lower level that extends below the white room, which will give techs access to the spacecraft's European-built service module for pre-launch adjustments. The CAA's installation marked the completion of 17 of the 20 major umbilicals and arms that will offer access, power, communication, coolant, fuel and other services to the SLS and Orion. The Interim Cryogenic Propulsion Stage umbilical, servicing the SLS's upper stage, and a pair of tail service mast umbilicals are scheduled for installation in the coming months. The CAA is the largest of the arms to be installed on the mobile launcher tower, which NASA has acknowledged has developed a slight lean. The deflection is not considered a structural defect. At NASA's Kennedy Space Center in Florida, a crane positions the Orion crew access arm so it can be attached to the Space Launch System mobile launcher. "The mobile launcher's massive steel tower is engineered to withstand the loads of the umbilicals that will connect to the SLS rocket, as well as to endure the natural forces such as wind, temperature and vibration," explained Granath. "Similar to skyscrapers and other large structures, engineers designed the mobile launcher to withstand the movements associated with predicted loads and to compensate for anticipated forces." "As each piece of hardware is installed, teams precisely measure the structure to ensure the required alignment of the swing arms and umbilicals with the vehicle interface are within the design tolerances," he wrote. After technicians check out the CAA and complete the many other ground support equipment installations, a crawler-transporter will move the mobile launcher out to Launch Pad 39B for a fit check and then back inside the VAB for further validation and verification tests. The first flight of the SLS, slated for 2020, will send an uncrewed Orion spacecraft around the moon on NASA's Exploration Mission-1 (EM-1). The CAA will be used as a bridge for engineers and equipment entering the capsule and will enable the ground crew access for processing and prelaunch testing while the launcher is in the VAB and atop Pad 39B. Astronauts are expected to first use the CAA to board an Orion on the launch pad for Exploration Mission-2 (EM-2), targeted for 2023. Get a bird's eye view and see more photos of the Orion crew access arm installation at collectSPACE.